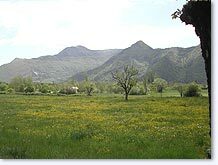 Sunny hillsides perfumed with lavender on the right bank of the Buëch; Veynois and Durance mountains on the left bank. From the Laragne-Val de Méouge area to the south, with its perched villages, orchards and Provençal markets, to the upper Buëch valley to the north, its sundials and snowy peaks, the Buëch area is full of contrasts, linking together the Alps and Provence. Far from the hordes of tourists, here you will find a perfect climate, simultaneously Mediterranean and sunny, and yet Alpine, nature here is authentic - gently sloping conifer forests, gorges, mountain streams and rivers - architecture that is still Provençal, as shown by the round "canal" tiles used for the roofing, and even some interesting architectural heritage (Stone Age dwelling at Col des Tourettes, Montmaur, Saint-André de Rosans Priory, etc). Lavender has been a tradition in the Buëch area ever since the early 19th century. The lavender essence harvested here is certified "appellation d'origine de Haute-Provence". 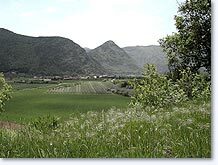 If you like intoxicating fragrances you must visit the distillery at Rosans or Faurie, near Aspres-sur-Buëch : to find out more about manufacturing essential oils. 1 Hotel at Aspres-sur-Büech. 2 Hotels at Eyguians. 1 Hotel at Lagrand. 3 Hotels atLaragne-Montéglin. 1 Hôtel à Montmaur. 1 Hotel at Rosans. 3 Hotels at Serres. 3 Hotels at St Julien en Beauchene. 1 Hotel at Upaix. 2 Hotels at Veynes. 1 Hotel at Ventavon. Orpierre, Serres, Rosans, Aspres-sur-Büech, Veynes, Montmaur.